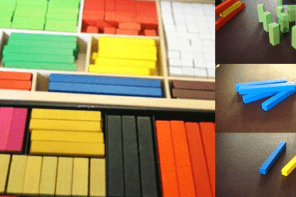 After the interest shown in the Cuisenaire Rods workshop at the Recent EdYouFest teachers’ event in South West England, I decided to write a little about them as a precursor to a 3 day Cuisenaire Rods ‘Retreat’ which will be held sometime in the new year. 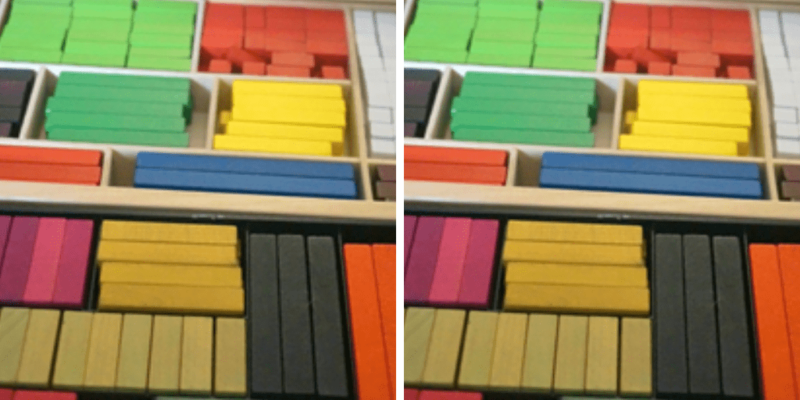 In about 1980, I discovered the Cuisenaire Rods (rods)! What I mean of course is not that I actually ‘discovered’ them but that they were introduced to me by fabulous teachers and trainers at what was then IH Hastings, on the South coast of England. As soon as I saw the rods, I felt drawn to their austerity and magnetic quality – so little doing so much. Later I met and was trained by the brilliant Caleb Gattegno for whom the rods were an essential component of his Silent Way; an approach which still has much to offer 21st century language learning. I spent many years developing new ideas with the rods and then introducing them to new and experienced teachers, which I still do. People always ask where they can find more information and I generally invite them to buy a set of rods and start using them! The reality is that I have been writing a book on the use of the rods for years and may one day finish it but until then, little articles such as this one and workshops which I run here and there may help to bridge the gap. In an attempt to describe the practical operation of the rods, I find that it is essential to discuss other aspects of teaching. I hope that even when I appear to be going off the rails, it will become clear that ‘x’ could not have been fully explained without background ‘y’. If I were talking about flash cards or any other classroom aids, I would want to do more than simply describe how to hold them up or stick them to the wall. If I seem to be indulging in superfluous detail, I ask you to bear with me; most of what I have written here is the result of questions put at workshops on the rods by folks who really want to have a go but aren’t sure where to start. 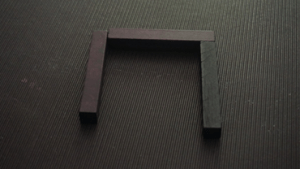 The idea first mooted by the late and great Dr. Caleb Gattegno, mathematician and creator of the philosophical language learning approach known as Silent Way, is that these little pieces of coloured wood (originally created by Georges Cuisenaire for use in the teaching of maths) can be used by teachers and students of language to create situations in which students can discover rather than ‘be taught’. They are as boundless as your imagination and as effective as you make them. They are not fool proof, unless you are. They are probably not the answer to all your problems, although in certain cases they can resolve difficulties which otherwise might remain unresolved. if they appear to be, it is only because they have been invested with certain properties by common agreement. This investment is made through the establishment of conventions, proposed by the teacher and accepted by the student and vice versa. Conventions fall into two main categories: passive and active. A passive convention is one adopted by the teacher without explanation; for example the manner in which he or she writes on the white-board or handles the rods. 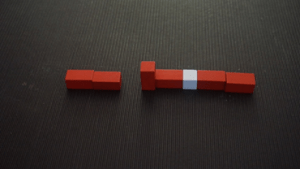 An active convention is one in which student collaboration and agreement is required; for example that red rods will be used to symbolise words. 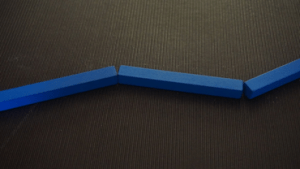 The rods are an aid, like a flash card or an IWB and can be misused just as any other aid can. An insensitive teacher can transmit his or her indifference with a crooked, old or badly presented flash card or a poorly written or copied reading passage; the damage done will be cumulative in the sense that after a couple of these slipshod deliveries, students will begin to realise that their teacher would rather be somewhere else. The same is true of the rods but more so. 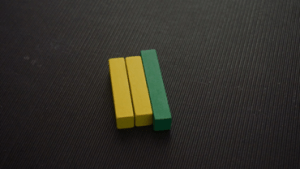 In the case of a flash card or reading passage, negative presentation may be balanced by stimulating content, although having said that it could be argued that mode of use, in TEFL jargon: exploitation, stimulates the student where content may appear to but does not; the rods have no stimulating content, they are just little pieces of wood in a plastic box. They may even be little pieces of plastic in a plastic box. There are so many utterly obvious ways in which these mathematically formulated lengths can be used, prepositions, comparatives, colour, number etc. 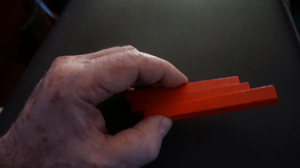 that over the years many teachers have come to accept that these represent the limitations of the rods without really trying to push the boundaries and discover more challenging uses. While I won’t ignore these obvious uses, my purpose here is to offer more creative and interesting uses from which teachers can develop their own ideas. 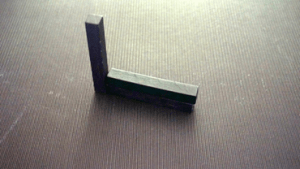 1) rods as rods, in which one can create a situation and comment on it. 2) rods as objects, in which one can create stories or contexts, inviting students to use their creativity and imagination to extrapolate or narrate. 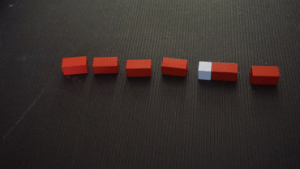 3) rods as words, in which red rods are laid our as phrases or sentences in order to focus on word order, sentence stress, phrasing and more. 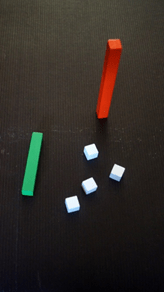 Rods as rods means that students are talking about the rods and their position, actions performed with them or their relationship to each other. In Silent Way, students generally work on structure and function using a very limited or restricted vocabulary for quite a while and then begin, via specially created books and pictures to substitute the word ‘rod’ for more authentic and interesting lexis. 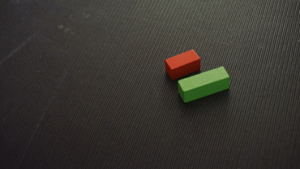 Thus, when one is eliciting, for example “Angela’s got an orange rod and 2 green ones”, the form is simply a vehicle which eventually leads to slot and fill substitution: “Angela’s got a black cat and 2 white dogs”. Of course I am not campaigning for Silent Way here but it’s necessary, in my view, to understand the thinking behind various uses of the rods. The word itself was used by Gattegno as it is ‘high meaning, low frequency’. In other words it has precise meanings (fishing rod, a rod for your back, conducting rod etc) but is not common in general speech. Compare for example with the word ‘get’ which is very ‘low meaning and high frequency’ – think of the multitude ways in which ‘get’ can be used and how often it is used in everyday language. So the word itself is chosen to function without particularly strong associations. It’s clear that when one is using rods as objects, that limited vocabulary becomes much more expansive, limited only by what you can manage to plausibly represent. Rods as objects can denote animals, structures, whole stories, people and much more. Sometimes a little mime or a quick whiteboard sketch is needed to back up what rods cannot show. I have a castle in one of my stories and to get there quickly, I usually draw a swift castellation on the board to then elicit what the four upright brown rods represent. As I have said, the rods can’t do everything so sometimes it’s faster to give students a clue rather than hoping they’ll get there sooner or later! It’s also true, in my opinion, that less is more where the rods are concerned. I could probably build a castle using rods but why would I waste time when I can represent the same using minimal time and effort? If a high focus on some aspect of language is needed, then rods as words can be a very engaging way to accomplish that. I have seen teachers using, for example, orange rods for verbs, blue ones for nouns, white for prepositions and so on but I find that unnecessarily complicated. Students spend more time trying to recall what’s what than actually working on the desired focus. I use red rods for words and white for contracted forms. Laying out a previously used sentence from your right to your left (the students facing you read left to right) and then eliciting it will establish the words those rods represent. Teacher’s view place them together in groups to show phrasing and move them to show word order. Also integral to the use of the rods is the teacher’s skill in eliciting. Rods usually sit on a table in front of the teacher with students gathered around in some way and it would be very easy to slip into a highly teacher-centred procedure where the teacher tells students things, such as what the rods represent and what students should say but that destroys the whole interactive, kinaesthetic nature of the rods, it also reduces the challenge to practically zero. 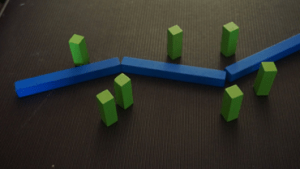 Eliciting is essential but setting a context is also essential since if I place a slightly crooked row of blue rods on the table and ask “What’s this?” the variety and number of possible answers is practically limitless! So setting a context or a scene requires some thought as does the way you formulate your eliciting questions. 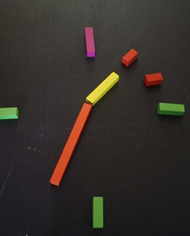 Placing some rods in a clock formation and asking “What’s the time?” is simultaneously telling students what your construction is and asking them to respond to it. Placing a red rod upright on the table and asking “What’s her name?” does the same thing – you’re letting them know that this is a person, they now need to provide a name! Earlier I said that things the rods represent need to be plausible. What I mean by that is that if, for example you are creating a zoo with young learners (something I’ve done many times), what animal might be represented by the tall orange rod? The long green one? Some small white ones? 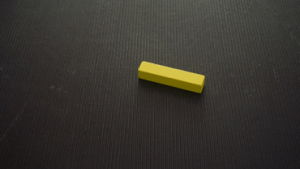 If you want to represent a factory, would you use two horizontal black rods on top of each other with a vertical one at one end or a single yellow rod? What I am saying is that some things can be more easily accessible if you use rods which are similar in some way; in my experience students, whether young or old will go along with the fantasy as long as it’s vaguely credible. Another point to make is that the way you handle the rods is quite important in my view. Careful handling, with clear gestures demonstrates careful thinking and clarity of intention. Keeping things neat on the table contributes to the sense that you care, I have two strategies in this regard: using a pointer to line rods up neatly as well as sometimes to point to rods rather than using fingers, and then, dedicating areas of the table for certain functions or processes, time references are usually on my right of the table, for example. This separation helps students understand what’s going on and of course assists the teacher in their endeavour to elicit rather than tell. Considering students’ view as opposed to yours, is part of this thoughtfulness which means that for example, if dealing with prepositions, students must comment according to their view, not yours! “There’s a white rod behind the yellow ones and on the left there’s a pair of upright green rods” will require you to ‘see’ the view you’re presenting from your students’ perspective. For this reason, I often advise new rods users to employ a mirror while they practice to see what students see. There is no substitute for actually seeing and using the rods but this first article has tried to lay out some ‘ground rules’. The second part will move on to specific activities describing how certain language might be elicited. 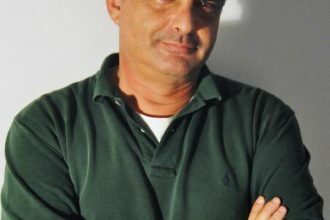 With an educational career spanning around 40 years, Steve Hirschhorn has worked as a teacher, DoS, Trainer, Senior Lecturer, Principal and Vice President in the ELT industry. In the 1980s Steve trained in Silent Way and Suggestopedia and later trained teachers in both. He has been External Examiner to three UK universities’ ELT related programmes and has twice won the Walpole Prize for Excellent in Teaching. Although officially retired, Steve continues to lecture and deliver workshops all over the world.